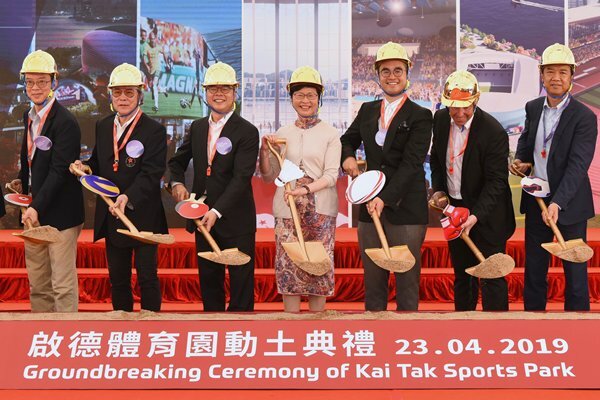 I am delighted to be here today for the groundbreaking ceremony of the Kai Tak Sports Park. Together we are witnessing an important milestone in the delivery of the largest multi-purpose sports venue in Hong Kong. This Kai Tak Sports Park is the Government’s most significant investment in sports infrastructure in recent years. When completed, it will play an important role in realising our sports development policy in terms of attracting major international sports events, supporting our elite athletes and promoting community sports. Like every one of us here, I am looking forward to the early completion of this new Hong Kong sports flagship and another significant landmark of our city. I wish the design and construction team every success in taking forward this major project and delivering this project on time and within budget. Chief Executive Carrie Lam gave these remarks at the Kai Tak Sports Park groundbreaking ceremony on April 23. On September 26, 2017, I attended the Shaw Prize Award Presentation Ceremony for the first time as Chief Executive of the Hong Kong Special Administrative Region. On that occasion, five distinguished scientists in astronomy, life science & medicine, and mathematical sciences were honoured. They are distinguished individuals who have achieved significant breakthroughs in academic and scientific research and whose work has resulted in a positive and profound impact on mankind. As I was then drawing up a multi-pronged strategy to develop innovation and technology in Hong Kong, including the promotion of popular science education, I asked myself how we could bring together this pool of great scientific minds to help nurture the next generation of young scientists. This was the beginning of a year-long endeavour to create the Hong Kong Laureate Forum. Under the vision and generosity of the late Sir Run Run Shaw and with the unfailing support of his wife the late Lady Shaw, the Shaw Prize was established in 2002 to recognize advances and outstanding contributions in three disciplines, namely, astronomy, life science & medicine, and mathematical sciences. In less than two decades, the Shaw Prize has become a world-renowned award for the highest achievements in mankind. Indeed, among the nearly 80 Shaw laureates since 2004, 18 of them have been awarded other world-renowned international awards, including 12 Nobel Prize awardees, four Fields medalists and two Abel Prize recipients. Hong Kong is blessed to have its home-grown international award and the Government fully subscribes to the Shaw Prize’s vision – to further societal progress, enhance quality of life and enrich humanity’s spiritual civilization. Since taking office on July 1, 2017, I have put innovation and technology development at the top of my policy agenda. In less than two years’ time, we have made some promising progress on various fronts including boosting R&D funding, pursuing additional infrastructure, creating technology clusters, etc. and committed some $100 billion for a range of initiatives. To sustain I&T development, nurturing talents and promoting popular science education have an important part to play. I believe the best way to spark the younger generation’s enthusiasm for science is to provide them with opportunities for direct exchange and dialogue with the brightest minds in science. Being Asia’s world city, Hong Kong is an ideal place to organise a world-class academic exchange event to connect the current and next generations of scientific leaders. Linking this objective to the Shaw Prize immediately came to my mind. A good place to start was to look at how similar forums around the world are planned and organized. Taking advantage of an earlier encounter in Hong Kong with the Lindau Nobel Laureate Meetings organiser and my official trip to Europe in June 2018, I went to Lindau, Germany to attend the 68th Lindau Nobel Laureate Meeting. While in Lindau, apart from taking part in the opening ceremony and welcoming reception of the Lindau Meeting, I shared the stage with two distinguished Nobel laureates and spoke on the topic of “Developing Stronger Science Leadership in Different Cultures – China, US/Europe & Others as Basis for Innovation”. The level of enthusiasm and interest shown by the young scientists in asking questions and presenting their views to the laureates reinforced my belief that a similar gathering of distinguished and young scientists will be a very meaningful endeavor for Hong Kong. While in Lindau, I also met with the Board Chairman of the Foundation for the Lindau Meetings Prof Jurgen Kluge to learn more about the organisation of the annual Lindau Meetings, and talked to five esteemed Shaw laureates who were also Nobel laureates. All of them warmly welcomed the idea of Hong Kong organising a Laureate Forum leveraging on the Shaw Prize. I was much encouraged. Supported by the newly created Policy Innovation & Coordination Office, preparation for the Hong Kong Laureate Forum began immediately after the delivery of my 2018 Policy Address. Thanks to the generosity of the Lee Shau Kee Foundation which has pledged full sponsorship for the forum, the support of the Shaw Prize Foundation, and a group of like-minded people who share my vision, we are able to take forward the initiative expeditiously. In April 2019, the Council of the Hong Kong Laureate Forum, which is responsible for the planning and organisation of the forum, was incorporated. Chaired by Prof Timothy Tong, immediate past President of the Hong Kong Polytechnic University, the board of the council comprises 11 distinguished personalities and academics in Hong Kong as members. They are Mr Raymond Chan (Chairman of Shaw Prize Foundation), Dr Moses Cheng, Mrs Rita Fan, Mr Henry Fan, Dr Victor Fung, Dr Colin Lam and Mr Martin Lee (representatives of the principal sponsor), Mr Carlson Tong, Prof Tsui Lap-chee, Mr Joseph Yam and Prof Kenneth Young. To allow sufficient time for organising a world-class academic event and recruitment of young scientists from all over the world, naturally including Hong Kong, the council has decided to hold the inaugural Hong Kong Laureate Forum in November 2021. The Hong Kong Laureate Forum will also be an international platform to encourage cross-cultural dialogue and is therefore establishing links with similar organisations. The Heidelberg Laureate Forum Foundation is our very first one. Similar to the Lindau Meetings, the Heidelberg Laureate Forum is an annual scientific event held in Heidelberg, home of Germany’s oldest university, for exchanges between recipients of the most prestigious awards in mathematical and computer sciences and young scientists. When I met with the Managing Director of the foundation Mrs Ruth Wetzlar in Hong Kong in January, she readily offered to present a lecture at the inaugural Hong Kong Laureate Forum featuring some of the laureates who are recipients of both the Shaw Prize and Fields Medal/Abel Prize. Backed by enthusiasm both locally and overseas, I am pleased to announce that the Hong Kong Laureate Forum was born! To celebrate the birth of the Hong Kong Laureate Forum, the council will stage a launching ceremony at Government House on May 14. Several Shaw laureates will join the ceremony to pledge their support for the initiative. university presidents, representatives of research institutions and major education bodies, members of the Executive and Legislative Councils, local young scientists, etc. as well as the media will be invited to the launching event. Such is the beginning of an exciting project. I wish to take this opportunity to thank the Shaw Prize Foundation, the Lee Shau Kee Foundation, the chairman and members of the Council of the Hong Kong Laureate Forum and Shaw laureates for their encouragement and support. Let’s join hands to make the Hong Kong Laureate Forum a shining example of furthering the understanding of science and its contribution to humanity. 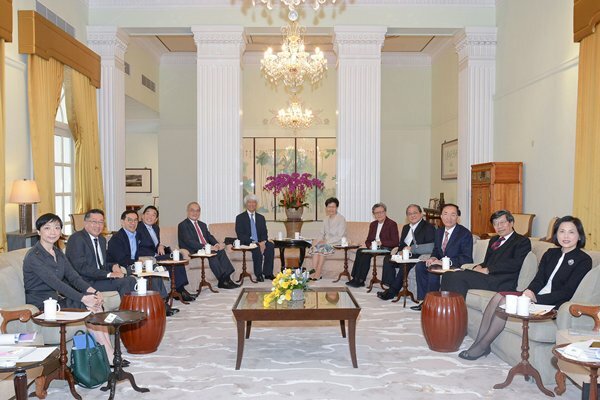 This article by Chief Executive Carrie Lam was published on the Chief Executive’s Office’s website on April 22. I am pleased to be here today for the opening of the brand-new Chai Wan Campus of the Technological & Higher Education Institute of Hong Kong, or THEi, as the Institute is so smartly known. It is particularly delightful to attend this grand opening, just a few months after my attendance at the opening of another new Vocational Training Council facility, the International Culinary Institute in Pok Fu Lam. I understand that there is one person behind both projects of VTC who is unable to join us this afternoon, that is the Honourable Dr Andrew Leung, the predecessor of Dr Roy Chung’s predecessor. For infrastructure projects like this, minimally you would require almost a decade of conceiving the project, planning the project, getting the approval and so on, so may I suggest we also give Andrew a big round of applause. THEi was launched in 2012 in Tsing Yi, offering innovative, self-financed degree programmes. As Roy noted, it has gone from a modest half-a-dozen offerings, and only about 200 students, to 20 degree programmes catering to the interests of more than 3,000 students today. And it will continue to expand to 22 degree programmes in the 2019-20 academic year. There are good reasons behind its soaring growth. THEi’s close collaboration with the Hong Kong workforce is certainly one of them. At last count, more than 300 industry partners were associated with THEi, taking full advantage of its enviable flow of talented young graduates who are well equipped with the necessary skills and knowledge for employment upon graduation. Its bachelor’s degree in horticulture and landscape development, for example, is Hong Kong’s very first horticulture programme, graduating professionals in arboriculture, horticulture and tree and landscape management. Capitalising on its collaboration with industry, THEi also supports research activities, equipping graduates with leading-edge knowledge to meet the challenges of today’s and tomorrow’s workplace. The opening of this Chai Wan campus showcases our Government’s ardent support of vocational and professional education and training (VPET) institutions. Beyond the subvented programmes provided by the Vocational Training Council, we have, in recent years, promoted self-financing institutions, including THEi, through a variety of initiatives that enable their development and provision of quality programmes. These include the Study Subsidy Scheme for Designated Professions/Sectors and the Non-means-tested Subsidy Scheme for Self-financing Undergraduate Studies. In the current academic year, THEi offers 12 programmes under the Study Subsidy Scheme, in disciplines such as architecture and engineering, creative industries and computer science. It also provides 28 programmes under the Non-means-tested Subsidy Scheme, covering disciplines ranging from the culinary arts and management to fashion design. In short, self-financing post-secondary institutions now play a significant role in offering and promoting VPET programmes. We are committed to supporting the sustainable development of the self-financing sector, and the Education Bureau is studying in detail the recommendations of a review on self-financing post-secondary education made by a task force led by Prof Anthony Cheung. We are no less committed to VPET in higher education – to ensuring that our young people can choose from multiple pathways in gaining the education they need for the future they want. VPET is central to those options, not only because of its focus on technical education and practical training. Equally essential is VPET’s whole-person development, the IT expertise and innovation it delivers and the soft skills and international exposure it imparts. Last April, my Government set up a Task Force on Promotion of VPET. It has been considering how VPET can better respond to the diverse abilities and interests of our young people, as well as create closer ties with business to meet the manpower needs of Hong Kong through this century of boundless opportunity. Next month, the task force will conduct a public consultation on its preliminary recommendations. Roy is the chairman of the task force, so I look to you to provide me with your recommendations after the public consultation. The grand opening of THEi’s new Chai Wan Campus takes us another vital step forward in the development of VPET in higher education and training. I had, just now, a quick tour around the campus, and was impressed by its many purpose-built facilities as well as the public space which will no doubt provide an innovative and sustainable learning environment for the students. I am grateful to all those who have contributed to the development of this dynamic campus. I wish THEi, its students and faculty the best of education and a flourishing future. 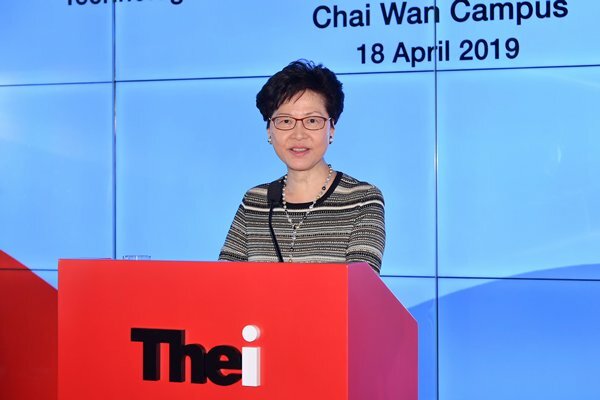 Chief Executive Carrie Lam gave these remarks at the Technological & Higher Education Institute of Hong Kong Chai Wan Campus opening ceremony on April 18. 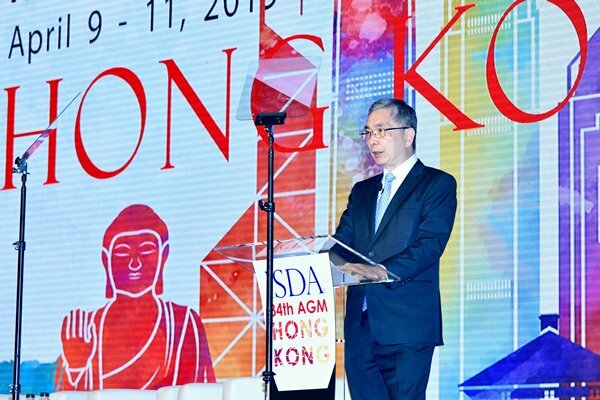 Given our status as a leading international dispute resolution centre in Asia Pacific, I believe that Hong Kong is indeed the ideal location for this event, which brings together 500 professionals from various sectors to exchange ideas on the settlement of disputes. The theme of today’s conference is New Era of Global Collaboration. It is a timely theme, for we need global collaboration more than ever to tackle the daunting challenges faced by the world. Uneven growth, diverging trade policies, financial instability and trade and investment disputes are rife worldwide. Indeed, the United Nations 2019 World Economic Situation & Prospects report notes that last year saw an upswing in trade tensions and a steep escalation in the number of disputes raised under the dispute settlement mechanism of the World Trade Organization. Beyond the more visible trade disputes, climate change and biodiversity challenges all call for global solutions. An increase in international trade and investment disputes seems to be inevitable given the growth in cross-border economic activities and transactions, especially in Asia. Buoyed by domestic demand, Asia’s GDP is expected to grow 6.1% a year on average between now and 2023. Hong Kong is taking full advantage of that growth. Nine of our top 10 trading partners are from Asia, and they accounted for almost 80% of our merchandise trade in 2017. Given the Free Trade Agreement & related Investment Agreement between Hong Kong and the ASEAN, which were signed in 2017 and are expected to come into force later this year after the necessary ratification process, trade and investment in this region are bound to flourish in the years and decades to come. Hong Kong, as a founding member of the World Trade Organization and a staunch supporter of free trade, would no doubt welcome trade growth. The key is to manage and settle the increasing number of disputes that come with it. In this regard, conventional litigation alone will not prove sufficient. Arbitration, given its established international conventions, rules and norms, has long been used to settle international disputes. And mediation is gradually sharing arbitration’s spotlight in international dispute resolution. Mediation’s attractions are many. It works to achieve an amicable resolution, given that settlements must be reached voluntarily. And that, of course, is conducive to maintaining business relationships among the parties involved. That said, the lack of an effective method for enforcing mediated agreements has been an impediment to its international development. In that regard, I am pleased to note the approval, last year, of the Convention on International Settlement Agreements Resulting from Mediation and its subsequent adoption by the United Nations General Assembly. The mediation convention, with its enhanced enforceability, is expected to boost mediation, particularly investment mediation, as a global means of dispute resolution. Hong Kong is actively preparing for that reality, providing dedicated training for investment mediators. The first Investment Law & Investor-State Mediator Training in Asia took place here last October. More than 50 dispute resolution practitioners and government officials from Asia and beyond took part. As an international legal and dispute resolution services centre in the Asia Pacific region, Hong Kong will continue to follow closely the development on international mediation and arbitration, while embracing the immense opportunities that may emerge. Thanks to our “one country, two systems” framework, Hong Kong maintains our common law system, underpinned by an independent judiciary and a deep and varied pool of legal practitioners from all over the world. Hong Kong’s judicial independence is recognised internationally and is ranked eighth among 140 economies. According to World Bank’s World Governance Indicators, Hong Kong’s percentile ranking in the rule of law has improved from 70% in 1996 to 94% in 2017, showing that the rule of law in Hong Kong has continued to improve over the years. Let me add that 14 eminent judges from other common law jurisdictions, including Australia, Canada and the United Kingdom, currently sit on our Court of Final Appeal as non-permanent judges, which in itself is a testimony to our rule of law and independent judiciary. Our economic system is no less attractive. We maintain a free-market economy, offering a simple and low tax regime and a level playing field for companies. The Heritage Foundation has named Hong Kong the world’s freest economy for the past 25 years in a row. The Fraser Institute also ranks us consistently the first in economic freedom. Those are our traditional strengths, and we are also developing new ones. In particular, innovation and technology is a policy priority of my Government, and Hong Kong is catching up quickly on that front. We are encouraging the application of technology in almost every aspect of our economy and society, including justice for cross-border disputes. A representative from our Department of Justice is chairing a Working Group in the Asia-Pacific Economic Cooperation (APEC), which has developed a framework for the online resolution of cross-border, business-to-business disputes. It will cut costs and overcome the geographical distance between parties involved. It will also promote the use of dispute-resolution services internationally. To support APEC’s work, non-governmental organisations here are creating an electronic Business Related Arbitration & Mediation system, or eBRAM in short. eBRAM is being developed as a secure and cost-effective deal-making and dispute-resolution online service for cross-border commercial and trade disputes, including those relating to projects under the Belt & Road Initiative. My Government is providing close to US$20 million to support eBRAM’s development and initial operation. We hope that eBRAM could facilitate business operation and achieve better access to justice by providing easily accessible and affordable dispute resolution services. We also hope that it could demonstrate Hong Kong’s unique competitiveness under the “one country, two systems” principle in addressing the service need of various jurisdictions with different legal traditions. Hong Kong is determined, and my Government is committed, to Hong Kong’s continuing rise as centre for international legal and dispute-resolution services. 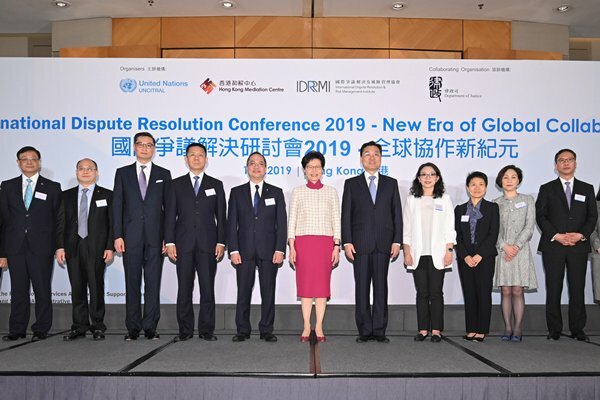 Chief Executive Carrie Lam gave these remarks at the International Dispute Resolution Conference 2019 on April 17. Technology is bringing unprecedented opportunities as well as challenges to our financial services – and the customers they court with their innovative offerings. The title of today’s forum, “The New Era of Finance Redefined”, has aptly pointed this out. As one of the world’s leading international financial centres, Hong Kong is blessed with a strategic location, the “one country, two systems” unique arrangement and ever-growing economic collaboration with the Mainland of China. Moreover, Hong Kong has a remarkably enabling environment for the development of fintech. After all, we boast a highly efficient infrastructure in information and communications technology, transparent and reassuring financial regulation, the free flow of capital, talent and information, the rule of law underpinned by independent judiciary, and a Government committed to a fintech future. The results, to date, are clear and compelling. Hong Kong is home to more than 550 fintech companies and startups. Celebrated innovation laboratories and accelerator programmes such as Accenture FinTech Innovation Lab, Deloitte Asia Pacific Blockchain Lab and the Floor from Israel have also established a presence here. Investment in our fintech sector is equally impressive. Over the past five years, fintech companies here have raised over US$1.1 billion, compared favourably with those based in Japan, Australia or Singapore. The Hong Kong Special Administrative Region Government is determined to keep this momentum going and be its staunch backer. Indeed, fintech is one of our top priorities, and we have rolled out a wealth of fintech programmes and initiatives. Last September, we launched the Faster Payment System. It connects banks and stored-value facilities – the so-called “e-wallets” – enabling the public to transfer funds instantly, in both Hong Kong dollars and Renminbi, anytime, anywhere. You need only use a mobile phone number or an email address as an account proxy. As of the end of February, the Faster Payment System had recorded more than 2.5 million registrations, processing over 8.7 million transactions in all. A very fast start, I would say. At the same time, we introduced the common QR code standard for retail payments. It helps merchants, especially small and medium enterprises, use a single QR code to accept various payment schemes. In January, the first phase of the Open Application Programming Interface framework for banks got going. In enabling collaboration with technology firms, it offers more innovative financial services. Our Securities & Futures Commission last year released regulatory guidelines to impose licensing conditions on companies managing, or intending to manage, portfolios that invest in virtual assets. The commission is now exploring whether it is suitable to and, if so, how it might regulate virtual asset trading platforms. As George noted in his address, the Hong Kong Monetary Authority has started granting virtual bank licences last month. This is a milestone for Hong Kong opening up the possibility for our banking sector to offer a new kind of customer experience. I’m sure the emergence of virtual banks will help SMEs and boost the competitiveness of the entire banking sector, and transform the banking experience for customers. Insurtech is the future as well. And we must all plan for it. Last year, the Insurance Authority launched a Fast Track scheme. It expedites applications by insurance companies, in or from Hong Kong, looking to use digital distribution channels solely in carrying out their businesses. The first virtual insurer under the Fast Track scheme was granted a licence last December. I am sure more will follow. The Hong Kong Federation of Insurers has also launched two insurtech initiatives: the Motor Insurance DLT-based Authentication System or MIDAS, a blockchain application to help authenticate motor insurance cover notes, and the Insurance Fraud Prevention Claims Database. This helps detect insurance fraud through artificial intelligence and big data means. It will prove particularly beneficial in cases involving multiple claims and syndicates. In trade finance, a blockchain-based platform was developed by a consortium of 12 banks here last October. Called eTradeConnect, it enables participating banks to digitise and share trade documents, automate processes, reduce the risk of fraud and improve overall trade finance processes. The Hong Kong Monetary Authority is now exploring connecting eTradeConnect with more overseas initiatives. 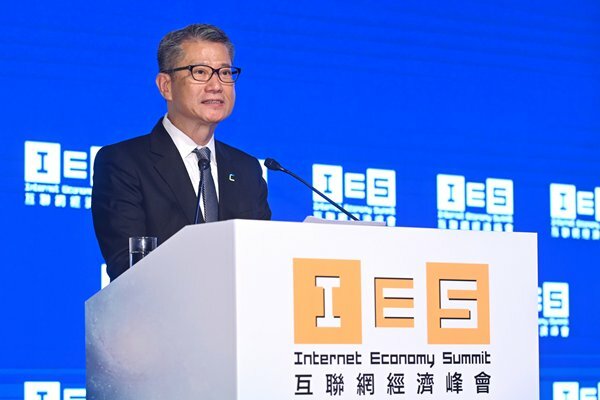 Financial Secretary Paul Chan gave these remarks at the FinTech Forum of the Internet Economy Summit 2019 on April 16. My Government believes in the promise of innovation and technology (I&T). Last year, at this forum, I outlined our major innovation and technology policies and programmes. This is an opportune time for me to update you on some of our initiatives. Over the past year, we have introduced a super tax deduction of up to 300% for R&D (research and development) expenditure incurred by private enterprises starting from the 2018-19 fiscal year. We have also set up an Innovation & Technology Venture Fund to co-invest in local startups. We have committed $10 billion to establish two research clusters that focus respectively on healthcare technologies and artificial intelligence and robotics technologies. We have also injected $20 billion into the Research Endowment Fund of the Research Grants Council to provide sufficient funding for R&D at universities. Taken together, these initiatives would considerably strengthen our innovation and technology ecosystem and provide a big boost towards our goal to double Hong Kong’s R&D expenditure as a ratio to GDP to 1.5% by the year 2022. For the two research clusters on health technologies and AI (artificial intelligence) and robotics that I mentioned last year, we have been sounding out notable international companies, universities and research institutions. The response, I am pleased to say, has been cheering. To date, we have received some 50 proposals, many of which are supported by an MOU signed with Hong Kong universities for undertaking joint R&D projects. We expect that the first research institutions will be setting up their laboratories at the Hong Kong Science Park before the end of this year. Our startup scene, I am pleased to say, is also flourishing. The number of startups in major public and private co-work spaces and incubators here in Hong Kong has grown 18% to more than 2,600 at the end of 2018. Of the founders, some 35% were from outside Hong Kong, showing that Hong Kong is an attractive place for talent and entrepreneurs from around the world. With the number of startups increasing, we are also sighting more unicorns here, with several of those begun at our flagship innovation and technology institutions – Hong Kong Science Park and Cyberport. Speaking of which, Cyberport is now home to more than 1,200 companies and startups, but we want more. That is why we have announced in this year’s Budget an allocation of $5.5 billion for the development of Cyberport 5. The expansion, expected to open in 2024, will add about 66,000 sq m of floor space to Cyberport. Our ability to attract institutions, startups, talent and investment from other countries is in no small part due to Hong Kong’s “one country, two systems” framework. That gives us a clear and compelling advantage in the region. This is underlined in the Guangdong-Hong Kong-Macao Greater Bay Area development. The far-reaching development emphasises co-operative development, focusing on the distinct strengths of each of the Greater Bay Area’s 11 cities, that is Hong Kong, Macau and nine prosperous Guangdong municipalities. One of our distinct strengths will definitely be our international network, established over the years under “one country, two systems”. Beyond our international connectivity, Hong Kong offers top universities and scientists, a pro-business environment, the rule of law underpinned by an independent judiciary, and reassuring intellectual property protection. It helps, too, that our logistics and communications infrastructure is world-class. Add it up, and you know why the world looks to Hong Kong to connect and excel. An Outline Development Plan for the Greater Bay Area development was promulgated by the Central Government in February this year. It identifies Hong Kong, Macau, Guangzhou and Shenzhen as the four core cities, as well as the key engines for driving the regional development. Among others, the plan expects Hong Kong to play a key role in the Greater Bay Area’s emergence as an international innovation and technology centre. This is in line with the steer and support given by President Xi Jinping who, noting our solid science and technology foundation and a large pool of technological talent, considers Hong Kong an important force in implementing the nation’s innovation-driven development strategy. Hong Kong is already at work in building an impressive foundation for our strategic role in the Greater Bay Area. The Hong Kong-Shenzhen Innovation & Technology Park, some four times the size of the current Science Park, is now under construction in Hong Kong, strategically close to Shenzhen. We are also enhancing R&D collaboration with other cities and research institutes in the Mainland, thanks to the relaxation of cross-boundary remittance for science and technology project funding. Financial technology is another important area, a growth sector we are committed to running with, for the Greater Bay Area and the Asian region as a whole. I know the Financial Secretary will be speaking tomorrow at the summit’s FinTech Forum, so I will leave it to him to detail the considerable advances we are making, from our Faster Payment System to virtual banking, insurtech and a good deal more. But let me just say that, with innovation and technology being the focus of the Greater Bay Area development, and given Hong Kong’s status as a global financial centre, the Greater Bay Area has all the potential to be both the Silicon Valley and the Wall Street of the East. Ladies and gentlemen, the theme of this year’s Internet Economy Summit is Digital Economy – Redefines our Future. With the encouraging developments that I have outlined just now, I would say that Hong Kong’s innovation and technology is developing in the best of times. In particular, with a population of over 70 million and a combined GDP of some US$1.6 trillion, the Greater Bay Area opens up a new development horizon for the region and provides Hong Kong with a huge opportunity to grow our economy and uplift the well-being of our people. It is up to us all to seize this opportunity. This year marks the 70th anniversary of the founding of the People’s Republic of China. Today’s summit is the first of the many events Hong Kong is organising to honour this significant milestone. There will be more to come, and I look forward to having you in our celebration events. 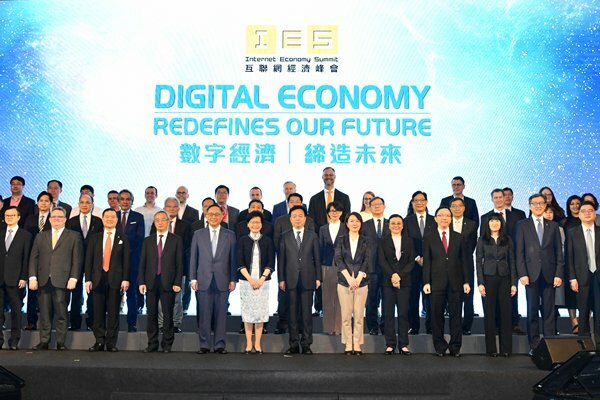 Chief Executive Carrie Lam gave these remarks at the Internet Economy Summit 2019 on April 15. Innovation and technology is a policy priority for my Government and an area of progressive growth and boundless promise for our universities. Hong Kong has what it takes to be successful in this field. To start with, we have world-class research capabilities. Four Hong Kong universities rank among the world’s top 100. That includes the Hong Kong University of Science & Technology, a founding member of the Asian Universities Alliance (AUA). Let me add that this prestigious university is among the top young universities in the world, leading the way in science and engineering-related subjects. Hong Kong’s technology research strengths include biotechnology, artificial intelligence and robotics. To expand on these and other areas of excellence, we have in recent years put in place numerous policies and programmes to promote research and development at our universities. Our Innovation & Technology Fund, for example, supports both applied and forward-looking R&D projects undertaken by our universities. We also have the Technology Start-up Support Scheme for Universities under the fund, which enables university professors and students to start technology companies and commercialise their R&D results. On top of the above, our Innovation & Technology Fund assists universities in their technology transfer. And, I’m pleased to note, R&D results among our universities are encouraging. A startup linked with Hong Kong Polytechnic University, for example, developed soft contact lenses and spectacle lenses that can retard the progression of myopia in children. Its related defocus-incorporated-multiple-segments technology won the Grand Prize at last year’s International Exhibition of Inventions of Geneva. The research behind this breakthrough was funded by our Technology Start-up Support Scheme for Universities that I mentioned just now. By the way, I am thrilled to learn from yesterday’s news and this morning’s newspapers that this year’s Geneva Exhibition of Inventions’ Grand Prize also goes to a Hong Kong company, a startup at Science Park, with a water-based manufacturing process to recycle and reuse lithium battery as its winning entry. Excellent work is also being done by the 16 State Key Labs and six local branches of Chinese National Engineering Research Centres here, which are funded in full or in part by the Innovation & Technology Fund. Hosted by Hong Kong universities, their achievements include the new stress-tolerant soybean cultivar, and the world’s first scientific model for predicting metal toxicity in marine environments and bodies of water. Let me add that Prof Dennis Lo, Director of the State Key Lab of Translational Oncology, was named among the Top 20 Translational Researchers for two consecutive years by the world-renowned journal Nature Biotechnology. Prof Lo developed a noninvasive prenatal diagnostic technology that has benefited millions of pregnant women around the world. And SenseTime, a home-grown technology company in the Hong Kong Science Park founded by Prof Tang Xiaoou has developed into the world’s most valuable AI startup in just a little over three years. And to boost our impressive talent base, my Government launched the Postdoctoral Hub last August under the Innovation & Technology Fund. It funds universities and other organisations in their recruitment of post-doctoral talent for R&D work. The Researcher Programme also supports them in the hiring of local graduates to assist in R&D projects. Since February, the maximum time period for these two programmes has been extended to three years. Response is overwhelming with the Researcher Programme having sponsored over 3,800 local graduates to join the I&T industry and the Postdoctoral Hub Programme having sponsored 360 postdoctoral talents to pursue a career in R&D. We are, in short, committed to helping our universities realise their full R&D potential. Our more ambitious goal, however, is to help build an international I&T hub here in Hong Kong. That includes the establishment of two world-class research clusters at our Science Park – one targeting healthcare technologies, the other AI and robotics. In each case, we are inviting renowned universities, research institutions and companies from all over the world to look to Hong Kong for their future. The response has been encouraging, and from such prestigious universities as Harvard, Stanford and Johns Hopkins in the US, Imperial College and University College London in the UK, the Fraunhofer Institute in Germany and the Institut Pasteur in France. From the Mainland of China, the Chinese Academy of Sciences and the Tsinghua University are amongst the active project proponents. In all, we’ve received nearly 50 proposals to date, and the first research institutions will be setting up their laboratories in two brand new buildings at the Science Park before the end of this year. We are also building unprecedented connections and opportunity through the Guangdong-Hong Kong-Macao Greater Bay Area. The city cluster comprises the two Special Administrative Regions of Hong Kong and Macao and nine major cities in Guangdong, and each of the 11 cities will contribute their respective strengths. The Outline Development Plan for the Greater Bay Area was promulgated by the Central Government in February this year, and the goal of creating an international I&T hub for the Greater Bay Area occupies a very prominent part of the plan. To that end, we are strengthening our collaboration with the Mainland on the I&T front under the “one country, two systems” principle. With the support of the Central Government, our local universities and research institutions are now eligible to apply for state funding on science and technology and the approved funds will be remitted to Hong Kong. Also in last year, we signed a co-operation arrangement with the Mainland’s Ministry of Science & Technology, which serves as an action guide and framework for us to enhance co-operation in scientific research, nurturing of talents, transfer of results, etc. We also entered into a memorandum of understanding with the Chinese Academy of Sciences, which will set up an affiliated institution here in Hong Kong to facilitate its research institutes to participate in the research clusters I mentioned earlier. And we’ve established a Greater Bay Area academician alliance to promote co-operation among academicians from the Chinese Academy of Sciences and the Chinese Academy of Engineering. They will help advise on the Greater Bay Area’s technological development. We would like to see more world-renowned universities and research institutions joining us, both for the research clusters being set up in Hong Kong and for the Greater Bay Area development. That is why university visits are now almost a must-see on my official itinerary overseas. Last week, during my trip to Japan, I visited the University of Tokyo, a member of the AUA, and had a very fruitful meeting with President Gonokami. Hong Kong definitely realises the importance of sustainable development. And the Government has rolled out various environmental blueprints and measures to tackle environmental degradation. 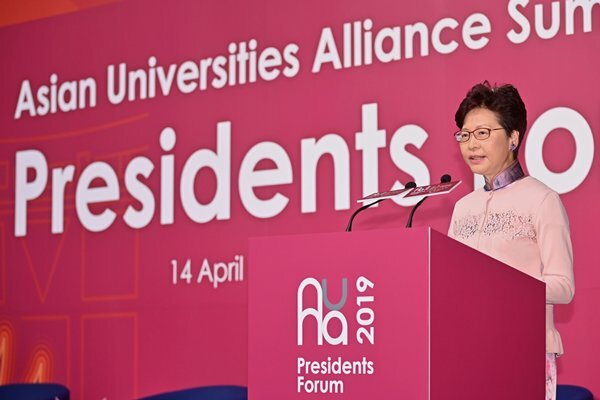 Chief Executive Carrie Lam gave these remarks at the Asian Universities Alliance Summit 2019 Presidents Forum on April 14. As a leading global financial centre, Hong Kong has much to offer, especially when Hong Kong has become the international financial centre at the doorstep of Mainland China and its huge financial markets. If one looks at the international markets, there are many worrying developments. Some concern geopolitical tension. Some pertain to international trade and the WTO (World Trade Organization) framework. Brexit is on your agenda too. And others are mulling over Brextension, with the word “extension” replacing “exit”. Global economic growth has been marked down generally across the board, with a few exceptions. So what are the prospects for Hong Kong? We remain cautiously optimistic and I will speak briefly to address this question. I will then move on to make some observations on certain key developments related to derivatives markets since the global financial crisis in 2008. Hong Kong is home to nearly 80 of the world’s top 100 banks, second only to Japan in Asia. Their aggregate balance sheets total around US$3 trillion. Our asset and wealth management sector has a total of about US$3.1 trillion of assets under management, with two-thirds of that coming from non-Hong Kong sources. Apart from the above bread-and-butter elements of an international financial centre, Hong Kong is unique in our being the leading global hub for offshore renminbi or Chinese yuan business. Hong Kong currently accounts for over 70% of global RMB payments. On the investment front, a restricted window for capital account transactions was begun in 2014, with the Shanghai-Hong Kong Stock Connect, which was followed by in 2016 the establishment of the Shenzhen-Hong Kong Stock Connect. With the convenient access to the Mainland capital markets through these stock connect schemes available on our markets, we have seen more participation by international investors in the Mainland markets. And so much so that we have now seen major international indices such as MSCI and FTSE Russell having included China A-shares in their index portfolios. And the weighting in MSCI is slated to increase to 20% over time too. The inclusion of A-shares in these indices not only demonstrates the success of the internationalisation of the Mainland capital markets, but also signifies the very crucial role that Hong Kong plays in the process. With these international developments, the demand for offshore risk management products and hedging tools has also been on the rise. In light of this, the Hong Kong Exchanges & Clearing Limited, which is our stock exchange, signed a licence agreement with the MSCI last month to introduce futures contracts on the MSCI China A-shares Index. The proposed futures products will cover the large and mid-cap A-shares under the MSCI China A Index, which are accessible via the Stock Connect and represent the A-share portion of the MSCI Emerging Markets Index. This will provide the necessary tool for international investors to track their A-share investments and to manage their risk exposures. Subject to regulatory approval and market conditions, the A-shares Index futures products can be launched as a key tool for risk management and I hope that will happen very soon. This is an important milestone in fostering Hong Kong’s important role as the offshore risk management centre for Mainland China. And incidentally I should mention that in the recently announced Greater Bay Area Outline Development Plan, there are four roles which we have identified as the key for Hong Kong. One of them is actually the risk management centre for the financial markets in China in the context of the Greater Bay Area. After talking about A shares, let me turn now to bonds. We launched in Hong Kong in July 2017 a Bond Connect with northbound trading initially. This enables overseas investors to access the onshore bond market through Hong Kong’s financial infrastructure, which affords investors greater convenience and flexibility. Such access is crucial because China’s bond market, which is worth around US$13 trillion, is the world’s third largest, after the United States and Japan, and its importance is continuing to grow. This is especially so when China accounts for about 15% of the global GDP stock but it contributes around 30% of the global GDP growth for the last few years. In fact, Chinese RMB-denominated government bonds and policy bank securities are being added to the Bloomberg Barclays Global Aggregate Index, starting this month on April 1, and phased in over a 20-month period. China’s weight in the index is estimated to increase to around 6% and renminbi will become the world’s fourth largest currency component in the index. China’s bonds generally have low correlation with developed markets and are regarded as an attractive alternative for investors who wish to diversify their risks. And our stock exchange has plans to develop onshore bond futures products to provide hedging tools for investors who are investing in the Mainland bond market. The increasing openness of the Chinese economy and its financial markets has seen Hong Kong continuing to be a magnet for businesses from the Mainland and around the world. Our latest survey shows a 6.4% increase in 2018 in the number of overseas and Mainland companies setting up in Hong Kong, and the total number now exceeds 8,750. The growth is even more prominent in the number of companies using Hong Kong as their regional headquarters, which now reaches 1,530, up 8.3% from 2017. Our startup ecosystem has also skyrocketed in the last few years. We now have over 2,600 startups in Hong Kong, representing an increase of 18% over 2017. The number of people employed by startups also increased by 51% to over 9,500. Ladies and gentlemen, after sharing the opportunities that we have in Hong Kong’s financial markets, now I would like to turn to three major developments related to derivative markets since the global financial crisis. Hong Kong is committed to implementing these G20 commitments. Our legislation was amended five years ago, with the enactment of the Securities & Futures (Amendment) Ordinance 2014, to provide for a regulatory framework for the introduction of mandatory reporting, clearing and trading obligations. The regime is being implemented in phases and is currently in force for over 90% of OTC derivatives in Hong Kong. This framework helps to reduce counterparty risk and increase market transparency. In the Thirteenth Progress Report on OTC Derivatives Market Reforms, published by the Financial Stability Board in November 2018, Hong Kong was recognised to have achieved satisfactory results and broadly fulfilled all international regulatory requirements. These all underscore the Government’s efforts in maintaining an internationally aligned regulatory regime and upholding the quality of our financial markets. We in Hong Kong will continue to contribute in this area to enhance the robustness of the international regulatory regime to increase the resilience of the financial markets while not stifling developments necessary for proper risk management. Now, the Financial Conduct Authority in the United Kingdom has already made clear that it will stop compelling banks to contribute to LIBOR after the end of 2021. It is conceivable that LIBOR could possibly become unsustainable or even obsolete if a significant number of LIBOR panel banks should leave the panel after end-2021. And one estimate has it that LIBOR is the benchmark for US$350 trillion in financial contracts worldwide, and I saw in the presentation by Scott that actually for IBORs in general, we are looking at US$370 trillion worldwide. To provide for a more tax-friendly environment for CTC operations, we have amended our legislation to allow interest deductions under profits tax for corporate treasury centres and to reduce the profits tax for specified treasury activities by 50%. This means a concessionary rate of 8.25% as compared to the full profits tax rate of 16.5%. To address the ring-fencing concern of the OECD, we have also made legislative amendments in July 2018 to extend the half-rate concessions to profits derived from domestic transactions as well as offshore transactions. We will continue to leverage the unique positioning of Hong Kong, seizing every opportunity to give full play to our strengths. Our upcoming policies look to opportunities unleashed by the Greater Bay Area development, the Belt & Road Initiative, and in fact, the whole of Asia and the world. We will enhance the resilience of our financial system, further improve our regulatory regime, and boost investor confidence and protection, all for sustaining Hong Kong’s unrivalled status as an international financial centre and risk management centre. Acting Financial Secretary James Lau gave these remarks at the International Swaps & Derivatives Association’s 34th Annual General Meeting. Being the headquarters for ACI Asia-Pacific, which represents over 100 members operating nearly 600 airports in 49 countries and regions, Hong Kong is well placed for ACI’s Annual General Assembly. Our world-class airport, the Hong Kong International Airport, is amongst the best in the world. Last year, our airport achieved recording-breaking performance by handling more than 74 million passengers and over five million tonnes of cargo and air mail. That made Hong Kong the world’s busiest cargo airport for the eighth year in a row. We are, as well, the world’s third-busiest international passenger airport. Aviation leaders are coming at a time when we are gearing up to play an even more important role in the airport business. The construction of a three-runway system for the Hong Kong International Airport began in August 2016, with commissioning of the third runway scheduled for 2022. Together with a new passenger building, a new automated people mover, a new baggage handling system and expansion of the existing Terminal 2 into a full-service processing terminal, this whole three-runway system will come into operation in 2024. When it’s up and flying, the revamped airport will be able to accommodate 620,000 flight movements annually, welcoming about 100 million passengers and handling some nine million tonnes of cargo a year. Realising those numbers will set the entire Hong Kong aviation sector soaring to unprecedented heights. No less important, it will benefit our entire community. Our Airport Authority expects that the three-runway system will create some 123,000 jobs directly, plus another 165,000 jobs either indirectly or through induced employment. Hong Kong International Airport connects with more than 220 destinations worldwide. That includes over 50 cities in Mainland China, one of the world’s fastest-emerging aviation markets. Mainland aviation has been a particular focus here recently, thanks to the promulgation of the Outline Development Plan for the Guangdong-Hong Kong-Macao Greater Bay Area. The Greater Bay Area brings together a cluster of nine cities in the Guangdong Province, together with Hong Kong and Macau, the two Special Administrative Regions of the People’s Republic of China. A collective economic powerhouse in the making, the Greater Bay Area currently has a population of 70 million and a combined GDP of US$1.6 trillion. The Greater Bay Area development is premised on the complementarity of the respective advantages of the 11 cities in the region. In Hong Kong’s case, amongst other things, we will play the leading role as an international aviation hub. Blessed by the Outline Development Plan, as well as the “one country, two systems” principle, Hong Kong will strive to maintain our airport’s leading status in the region, and enhance our services through innovative measures, such as inter-modal code-sharing services. The recent expansion of the intermodal code-sharing arrangement will bring about plentiful opportunities in the years ahead. It enables travellers to use the same air ticket to continue with their journeys to different Mainland destinations or vice versa by ferries, coaches or trains. The Intermodal Transfer Terminal project, to be completed by 2022, will provide passengers with hassle-free connections from the Hong Kong-Zhuhai-Macao Bridge to our boarding gates. Our airport is also embracing autonomous vehicles, robotic-serving devices, facial recognition technology and much more. It’s determined, as well, to become the world’s first airport equipped with a 5G communications network. Innovative technology demands equally innovative talent. In that regard, the Hong Kong International Aviation Academy, established in 2016, has already trained more than 10,000 industry participants. The programme, I should add, works not only with Hong Kong people but aviation industry students and practitioners around the world. In particular, the academy can help train students from countries along the Belt & Road and contribute to their capacity building. With our airport sitting right at the heart of the double gateway connecting to the Greater Bay Area at one end and to the world at the other, Hong Kong offers seamless air-to-land and air-to-sea connections with a huge number of nearby destinations. It makes perfect sense to leverage on the unique advantage of our airport to foster a wider network of inter-related business activities. Indeed, our vision is to engineer our city’s airport to become an aerotropolis with high economic efficiency and diversified employment opportunities, so as to enhance Hong Kong’s position as an international business centre. The development of this aerotropolis is in line with worldwide trends, and we are embarking on various novel and exciting developments to make this happen. Our SkyCity is one of the key economic locomotives, which will spin off enormous opportunity with the infrastructural developments in the proximity. We envisage the SkyCity to become one of the largest commercial developments in Hong Kong providing a full suite of hotel, retail, dining and entertainment facilities. It is destined to be a destination of its own, serving local residents as well as visitors from overseas and the Greater Bay Area. There is more – this very facility where I am standing right now, the AsiaWorld-Expo, is exploring its next phase of development to meet the growing demand for exhibitions and events. A high-end logistics centre covering an area of approximately 5.3 hectares at the southern cargo area of the airport is also being developed, which is expected to be in operation in 2023. Looking further ahead, the topside of the Hong Kong Boundary Crossing Facilities Island of the Hong Kong-Zhuhai-Macao Bridge will be put to good use. There will be tremendous synergies among these developments in the making of our visionary aerotropolis. There are exciting times ahead for our airport. I would invite you all to come visit again in future, and see for yourselves how we turn all these promises and visions into reality. 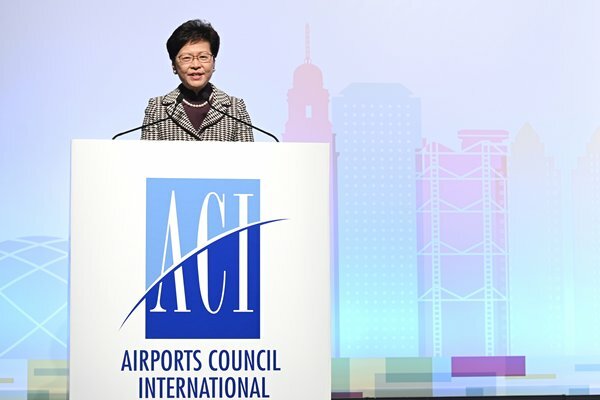 Chief Executive Carrie Lam gave these remarks at the 2019 Airports Council International Asia-Pacific/World Annual General Assembly, Conference & Exhibition on April 3. When it comes to aviation, Hong Kong has long attracted attention. The attraction begins with our strategic location in the heart of Asia and within a five-hour flying time of half the world’s population. No less important, we are the premier international gateway to the Mainland of China. 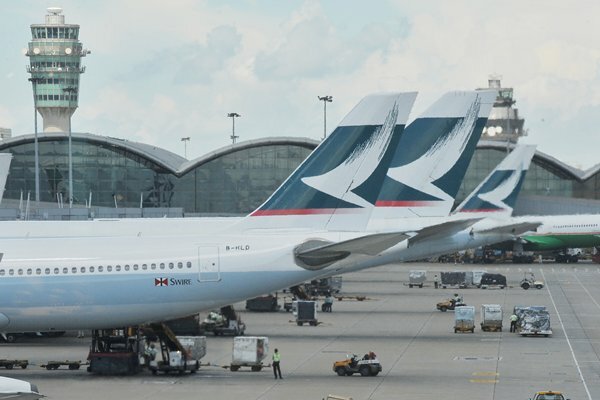 Today, more than 100 airlines operate about 1,100 flights between Hong Kong International Airport and some 220 destinations around the world, including 50 on the Mainland. We are working to build on that impressive track record, further liberalising our air services system to expand Hong Kong’s aviation network. To date, we have signed air services agreements with 67 aviation partners. We have also signed air services agreements and international air transit arrangements with 49 economies along the Belt & Road. For the past nine years, Hong Kong International Airport has been the world’s busiest cargo airport. And we have been continually advancing our cargo handling capabilities and facilities, plus lowering the cost of importing and exporting goods, particularly high-value goods, to and from Hong Kong, with a view to moving our trading and logistics industry up the value chain. In fact, our airport has been named a Center of Excellence by the International Air Transport Association, in recognition of its prowess in handling both pharmaceuticals and perishable products by air. Indeed, it was just last month that the association recognised the Hong Kong International Airport as a Center of Excellence for Perishable Logistics, making us the first airport in the world to receive such certification. To meet future air traffic growth and maintain Hong Kong’s competitiveness as an international aviation hub, the Airport Authority is expanding our airport into a three-runway system. The Airport Authority is also studying the topside development of the Hong Kong Boundary Crossing Facilities Island of the Hong Kong-Zhuhai-Macao Bridge, which, together with other developments on the Airport Island, will turn Lantau into an Aerotropolis connecting to the Guangdong-Hong Kong-Macao Greater Bay Area and the world. Hong Kong’s strengths in several critical areas, including financial services and aviation, were reaffirmed in the Greater Bay Area’s Outline Development Plan. It also underlines Hong Kong’s leading role in the development of high value-added aviation businesses such as aircraft leasing and financing. To maximise our opportunities in this area, the Government provides attractive tax incentives for aircraft leasing businesses. A flourishing aviation industry demands sustainable supply of talent. Which is why, in 2016, we set up the Hong Kong International Aviation Academy. To date, the Academy has offered programmes ranging from entry-level to postgraduate level for more than 12,000 people. Financial Secretary Paul Chan gave these remarks at the Aviation Silk Road International Conference on April 2.